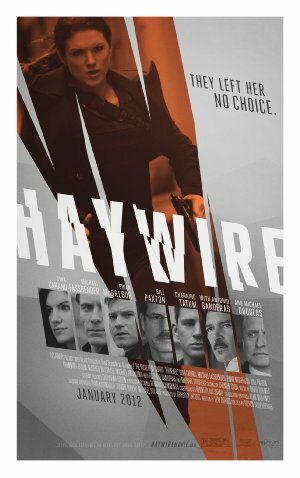 Gina Carano steps out of the Mixed Martial Arts octagon and in front of the camera and proves herself capable of carrying a film in Haywire, the latest offering from the prolific director Steven Soderbergh. This action flick will probably win no awards, but it’s a good popcorn action flick and the action scenes are worth the price of admission alone. That’s a good thing since screenwriter Lem Dobbs’ script is fairly pedestrian, but there’s no pretense about this movie being anything other than an outline for a series of excellent fight scenes. Carano plays “Mallory Kane,” a former Marine whose father was also a Marine. He (Bill Paxtxon in a strong performance despite the small role he plays) is now a famous author who worries about his daughter’s current work as a “black ops” contractor employed by Kenneth (Ewan McGregor). The first part of the movie shows Mallory’s story being told in flashback, after an attempt to meet with Kenneth goes horribly wrong. She tells how she’s come to this point to Scott (Michael Angaro), who comes to her assistance when it looks like she needs help. She was on a mission with Aaron (Channing Tatum) for Kenneth, along with a few other people and the mission appears to be a success. But betrayal lurks around the corner and soon Mallory is left out in the cold, and must somehow overcome massive obstacles to clear herself from a very neat job of framing her. Scott provides some assistance at the start and eventually she turns to Coblenz (Michael Douglas), who gave the job she was on to Kenneth. Nice to see Douglas working and looking healthy. Rodrigo (Antonio Banderas) was involved in the mission at the tail end, wearing a gray beard for some reason. Will Mallory beat the crap out of all the bad guys and triumph in the end? It’s a typical action flick, so decide for yourself. What makes Haywire fun is that rather than taking a good looking actress and having her train and practice so she can appear to be a badass, Soderbergh has taken a real-life badass and given her a chance to shine. Carano, who looks just fine in fight togs or an evening gown rises to the challenge. She’s one of those women the camera likes, but doesn’t love, and her expertise in Muay Thai and as an MMA fighter lights up the screen. BTW, if you’re looking at her and swearing to yourself you’ve seen her before, if you were a fan of American Gladiator, you might have seen her in her role as “Crush”. I liked Uma Thurman in the Kill Bill films, Angelina Jolie in Mr. and Mrs. Smith, along with other actresses like Kate Beckinsale, who have taken a dip in the action film genre. But like Angela Mayo Ying and Cynthia Rothrock before her (two female martial artists who moved from the ring to the big screen), Carano is the real deal and it shows.